Welcome to the first day of my Floral Thoughts Mini Series! At this point I don't know how many cards will be in this series, but the thing is, I really (REALLY) love Clearly Besotted and floral images and "Just because" cards, so I figured I would make a mini series that will go on until I've moved on to something else. I mentioned before that I recently got a nice little Clearly Besotted haul, and I cannot stop using them. I really can't say or recommend them enough. To begin, I stamped the floral image from Clearly Besotted's "Friends Forever" stamp set with Memento Tuxedo Black ink on to Copic Friendly Paper. I also created a mask for the image using 2" post it tape. I masked off the image and sponged Antique Linen Distress Ink with a random stencil (sorry, don't know which one or where it came from). I then removed the mask and coloured the image with Copic markers. I then covered the flowers with clear Wink of Stella. I used some twine from my stash and wrapped it around the card base and then tied a knot. I stamped the greeting in Memento ink as well so that the blacks would match. I had considered using sequins or enamel dots across the space, but it started to look way too cluttered and ultimately I'm very happy that I left them off. "May all your Weeds be Wild Flowers"
Love the pattern and colour of your background, it really makes those gorgeous flowers pop. And your so good with your twine, its tied perfectly, mine always ends up in a bunch!! 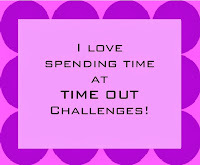 Its a perfect card for our challenge and I'm so glad you joined us at TIME OUT!! This is truly stunning! Floral cards are my favorites, I'll start to follow your blog so I can see how your mini series evolves, sounds great! Thanks for taking TIME OUT and joining us!